The goal of this 2nd level industrial hydraulic course is to develop maintenance personnel with advanced hydraulic skills. Students achieve this advanced capability with substantial lab exercises. During the week students will be presented with a variety of hydraulic valves and they will evaluate several hydraulic circuits. The instructor will guide them through the process of discovery of valve function and operation. They will develop their understanding of the purpose and operation of the hydraulic circuit in which the valve is used. Lab exercises are challenging. The same process of discovery and understanding is applied to pumps and variable displacement pump controls and accumulators. Students will develop hydraulic schematic reading skills. 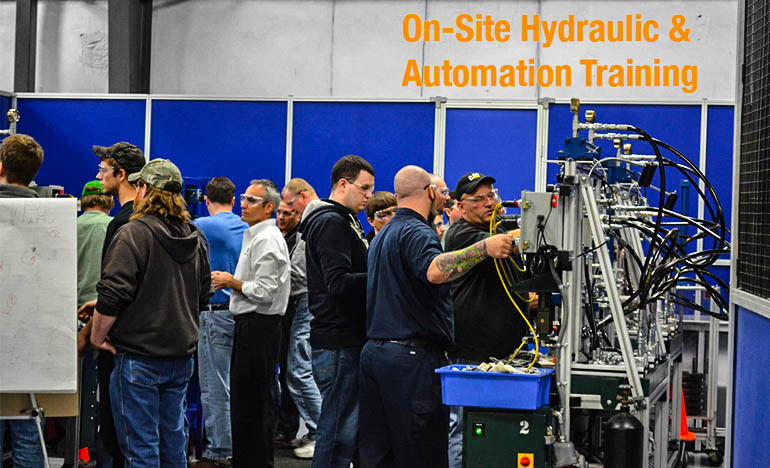 Prerequisite: This is a 2nd level hydraulic training course. To enroll the potential student must have completed a bona-fide hydraulic principles course of study.